Drill free bolt on kit for the Mercedes Marco Polo campervan. A kit that requires NO DRILLING AT ALL. £399 for a complete 120W kit. There is also the option to go for two panels giving you 240Watts of solar power. 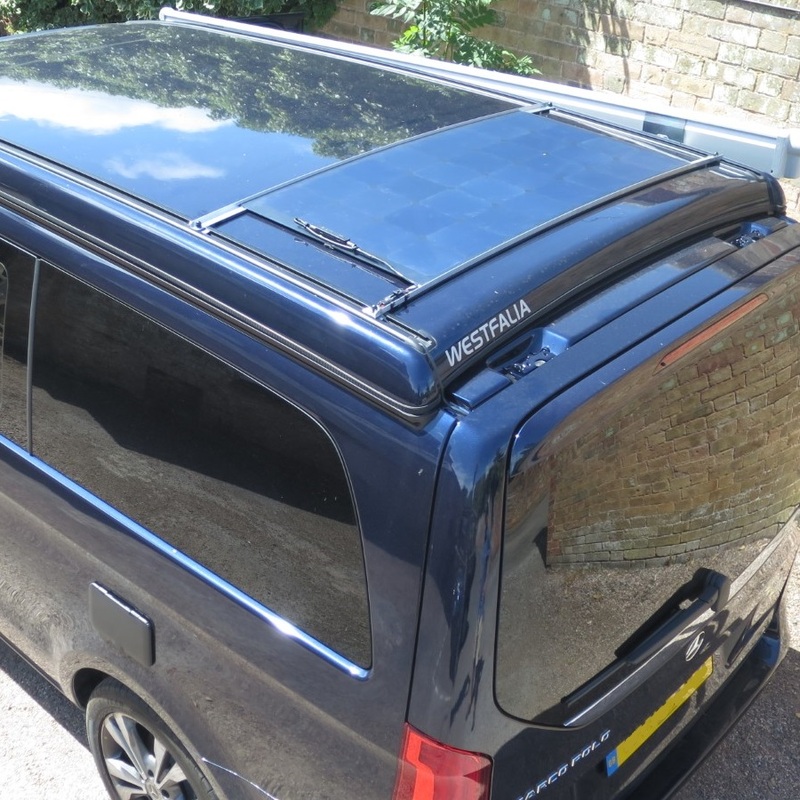 Due to customer requests, we've created a slimline kit that slots into the Marco Polo roof rails with cabling that passes through an existing tailgate grommet - instructions provided). Installed, it is lower than the awning, keeping your total height under 2m. - Foam backed panel edges to protect paintwork. - Easy slide-in system to your existing roof rails. - Waterproof connector that lives in the roof rail. - All cables needed to connect to your leisure battery. - Photo instructions include step by step details on how to route the solar cable through an existing tail gate grommet for a neat installation. - Can be used with roof bars. Note: The appearance of the panel may vary depending on current stock (some are black on black, some black on white). They are all however, predominantly black. Please let us know if you need a specific colour - black or white. Below: 2019 MP kit with 120W EFTE aluminium reinforced panel and optional Victron Bluetooth MPPT charger.